It doesn't actually seem that groundbreaking. It is not like he has Michael Ben-Ari and Marwan Barghouti. He has a Palestinian talking about Palestinian rights and he has an Jewish leftist talking about Palestinian rights. They are advocating a non-violent approach, both from a Palestinian point of view. 1. Michal continues the discussion about Ivanka Trump's conversion and marriage. 2. Jew Wishes reviews a book - The Dentist of Auschwitz. 3. Not Brisker Yeshivish explains how Brisker endorsements works, and how careful Reb Chaim was before he gave an endorsement. 5. Israel Chronicles discusses how much of tzniyus is about perception. 6. Frum n Flippin comments on what she thought would be happily ever after, as she now realizes, even before the fact, that that is not how it works. I have no doubt that just like every year, this ceremony will be a stage for incitement against the religious-Zionist public. The Burqa Lady is in the news again. This time, she and her lawyers have turned to the Red Cross demanding their assistance. They petitioned the Red Cross saying her conditions in prison in Israel are reprehensible and they have despaired of the situation. She is imprisoned by herself for over a year in a small room with no ventilation, while she clothes herself in multiple layers, her body is inflicted with wounds and she refuses to have them treated by a doctor because of tzniyus issues. And whose fault is this? She refuses to be treated for her wounds and she is blaming the Israeli prison system for this? she has no air, yet she wears multiple layers of clothing - take off a layer or two. How can they possibly air out the room enough for her with her wearing 7 layers of clothing? The children have petitioned the authorities saying their mother is mentally unstable and that is why she abused them, and she needs rehab not prison. I don't know what right they have to make such a demand. Sure she needs rehab and I hope she gets it. but they have no right to demand that she not be punished for her crimes against them and against society. She has to sit in jail, and also she needs rehab. The prisons are not really rehabilitation centers, and that is a shame. Many prisoners would benefit more from being in a rehab center and getting treated for whatever their problems are rather than being in prison. But when a crime is committed, prison is the punishment even if it does not necessarily provide the rehab, unfortunate as it may be. I wonder if petitioning the Red Cross has a din of being a moser. Maybe because the prison services and courts are not frum, perhaps there is not such an issue. Vaad HaRabonim respond. ho hum. Just like to most people the Transportation Ministry's committee recommendation against allowing mehadrin bus lines to operate was expected, as the State cannot really support anything resembling discrimination, the response is also just as expected. I wonder how long ago they wrote the response... was it as soon as the committee was formed a few months ago or only after the committee submitted their recommendation? 1. Modern Uberdox has pictures of a Hachnassat Sefer Torah in Chicago. The Chief Rabbi of Israel, Rav Amar, attended. 2. Rabbi Fink discusses the controversy in the White House - the claims that the White House is too manly. 3. DovBear has a post wondering whether us Orthodox Jews actually believe in the power of prayer, based on how we behave in shul. I don't think it is a matter of us not believing in it, but it is just so common - we daven three times a day every day - and results are often not seen directly, so we let it become very common, we get distracted. Yes, we know we are talking to God. But we do it so often, we kind of have become good buddies with Him instead of having the reverence we should. Perhaps. 4. Circus Tent on Rav Shimon Shkop's tophat. 5. Israeli Kitchen has the Kosher Cooking Carnival - #46. 6. 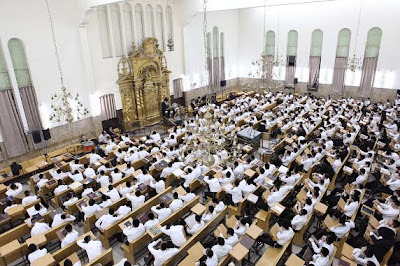 SemGirl is back with a post on the shidduch crisis, preferring to call it a "seichel crisis" instead. 7. Muqata lets you know how you can tell you are pro-Israel, in light of the JStreet conference. 200 protesters that tried to disturb the tour of the areaby calling out slogans, created an atmosphere that was not respectful and shamed the city. The police removed them, but the unpleasant feeling remained.. I was elected to build the city. Whoever doesn't like that, can wait until the next term and choose a mayor who will sit idle. 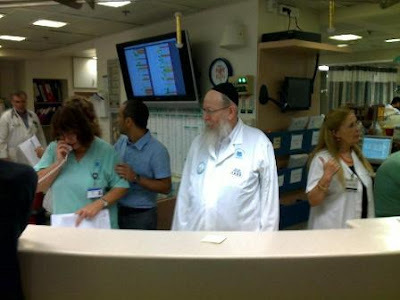 "Dr. Litzman" on a tour of Ichilov Hospital. he also measured blood pressure, took temperatures and spoke to patients and hospital employees... for more pictures, see Haredim site..
Today is supposed to be the day the Israeli Supreme Court finally decides on the legality of the "mehadrin" bus lines. Unexpectedly, the committee formed by the government to analyze the issue and make the recommendation to the Court on its behalf, has recommended that the lines be canceled as they are discriminatory and illegal. This, I think, is unexpected, because many expected, based on statements by members over the many months of deliberation, that the committee would recommend allowing the lines to function under certain guidelines. If a specific community wants it, and nobody is forced to use it, and alternatives are provided for those who need to travel by bus and do not want to sit separately, the thought was that it should be allowed in limited capacity. The State however has to protect all victims. Not just those that are obvious. I recently had a discussion with someone, on Twitter, about the Arabs rioting on Temple Mount. This person, a supporter of the Arab side in the issue, thinks Israel is not a democracy but a military state. What right, he/she asked, does the military have to go into a place of worship? Somebody threw a stone and they raid the Mosque with such a large force? Over the course of the conversation/debate, a number of such questions were raised in various formats, with this person basically claiming that the Arabs are hurting nobody and so they get a little excited and make a little trouble, so what. The State has to protect the obvious victim - the other tourists on Temple Mount, the Jews by the Kotel, and other intended vistims wherever the riots might spread to. But the State also has to protect the less-than-obvious victim - the Arab on Temple Mount who might get hit with a rock unintentionally, the Arab working nearby who is affected by the stone throwing, the people who get hurt as bystanders. The same is true in this case. Even though a community might say they want it, many, or some, within the community might not want it, but cannot say so. 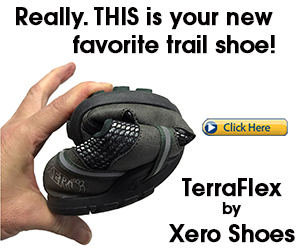 It might look like everyone wants it, but that might not be the case. Women can't always speak up and voice their minds and opinions (in these communities that support mehadrin bus lines). They are kept quiet, they are afraid to say anything in opposition to the opinion made public by the leaders, etc. They are forced to ride the mehadrin line, even if they don't want to, and are forced to say that they prefer it. They are the unintended victim. The less obvious victim. The obvious victim is the women who don't want and say so, but are forced anyway. The less obvious victim is the woman who goes along with it because she can't say anything, but really doesn't want it. And the State has to protect them as well. So, while maybe there is room for such lines, under certain guidelines, the State cannot support it. the State has to protect the general public, all the victims within, and only support equality and democracy. Whoever thought the State would support mehadrin lines was fooling themselves. Now we have to wait and see what the Court decides. Will they allow it, with a strict set of guidelines, or will they deem it illegal... Stay tuned. Yesterday was meant to be a major step in the plans for the future of Bet Shemesh. It was, but not in the way originally intended. Recently the tenders for the upcoming construction of RBS C/3Gimmel were published, and kablanim have been having their meetings to find out the requirements and needs so they can plan for submitting bids for the tenders. Yesterday was supposed to be a big step, as the city was holding a meet for the kablanim, with the mayor introducing the plans, and then taking the group of kablanim to see the area that is slated for construction. It was a big day, but for other reasons. People from the Dati Leumi and Secular communities came out to protest. The feeling is that the original deal of splitting the area into thirds, with each community getting a third of the land for housing, is being ignored and the city has a deal with the Housing Ministry which gives all the land to the haredi sector, plus planning for future allocations that have not yet been discussed in City Hall. Basically the protestors shot down the meeting, not letting the mayor speak or be heard. The chanting focused on the calls of Abutbol as a liar and breaking the agreements he had in place, along with chanting that for every brick laid there will be a protest. Then when the group went to the shetach, the people blocked their access with cars and a protest. Some kablanim continued up by foot, but many left the area, basically rendering the meeting moot and a big waste of their time. The protest reminds me of when the city under Dani Vaknin's mayorship brought in kablanim when planning the construction of the ma'ar, and the haredim broke up the meeting with protests also chanting for every brick their will be a protest. The Dati Leumi and Hiloni have now learned from the haredim and have accomplished an equally successful protest, when until now that has been the expertise of the haredi community and the DL/H were basically impotent in this regard. What I don't get is how so many people can be at these things in the middle of the day? Doesn't anybody work for a living? Are so many people self-employed and/or work "American hours"? 1. Artzeinu blog is hosting Haveil Havalim #240..
2. Dry Bones documents the shift in Israeli Extremism..
5. Garnel Lionheart writes about nationality vs. identity and the desire to create a new identity for the non-religious Jew in Israel. 6. Muqata has a very strange sign sponsored by the New York City Health Department about washing hands. The Mea She'arim communities are having a bad streak right now. "Director of Operations" Yoelish Krausz was arrested yesterday for attacking a woman a while back who wouldn't cross the street, and tossing tear gas at women. In better, or worse, news, today Krausz was released from jail after agreeing to the condition that he be under house arrest for 5 days and he was expelled from Jerusalem for the time period. Unfortunately that means he is likely to end up in Beit Shemesh, where all the crazies from his community who left Jerusalem go to. Also, for 30 days he cannot participate in rallies or protests or be involved in such activities in jerusalem. The Toldos Avraham Yitzchak Rebbe was detained at the airport in New York under suspicion that he might be smuggling drugs. After being checked by security, he was found to not be smuggling, and was let go. They suspect the security was given a false tip by rival groups looking to shame the Rebbe with a demeaning security check. Turkey is now saying it is unfair to pressure Iran about its nukes. Turkey is saying Israel threatened to bomb Palestinians with nukes. France said the whole attempt to make a deal with Iran is to stop Israel from bombing them. Libya/Qadhafi has said that the Palestinians should be allowed to have nuclear weapons. Russia has said today that Iran has the right to develop nukes. Iran announced they are developing atomic fuel. I wonder why the sudden spike... is there something unusual developing? I got a ticket the other day. First time in like 10 years. I was driving to Bnei Brak for a wedding, and nearly missed the turn up to Givat Shmuel - Bnei Brak. There is no sign warning of the impending highway exit. It just happens with a sign at the exit itself. So, I see the sign at the exit and swing in. It seems that is a fairly common spot for things like this to happen and the police lay there in wait and grab offending drivers. My crime was not waiting in line but cutting into traffic ahead of other cars in the lane. I didn't even know this was illegal - I thought as long as you cross a dotted line it is legal - I signalled with my blinker and cut in. And my second crime was crossing a bold line. I didn't think I did - I thought I cut in before the bold line appeared, as I cut in as soon as I saw the sign for the turn, but maybe I just missed it. Anyway, the cop pulls me over and she tells me what i did wrong. I am not one to argue about these things. She asks me what I have to say for myself, where I was going, and if I am in a rush. I said I am on my way to a wedding in Bnei Brak, but I am not in a rush. I found out later she was a bit disappointed by that answer, as if I had said I was in a rush it would have been an admission of guilt - I am in a rush so I cut in. But I wasn't in a rush, just only saw the sign at the last minute. If not in a rush, a driver is less likely to do the crimes she was stopping me for. Anyway, she thought for a minute and then the funniest exchange took place between a driver and a cop. She started negotiating with me whats he would write me up for. She was basically negotiating with herself, as I am horrible at that kind of stuff - talking my way out of tickets and the like, but it was still funny. She started weighing all the options of what she could throw at me, and what the ramifications would be. She in the end decided to write me up for only one of the transgressions, not both, and told me what I have to do to get it converted to a warning, considering I have not had a ticket in 10 years or so. She told me not to pay the ticket, but to copy it and mail it to the the Traffic Office of the police and request they convert it to a warning because I am not from the area and was unfamiliar with the roads, etc. The fact that she started negotiating with me what she would write me up for was humorous and a bit surreal. I guess she expected me to start arguing, and had prepared for that by mentioning the worst she could do, but she had not actually planned on doing it, considering I was a nice guy (I even held her flashlight for her so she could see while she wrote me up). Very strange, but there must be a lesson in the incident somewhere, aside form don't cross bold lines and don't cut into traffic.. The people do not regret removing Livni from the leadership of the country. Whoever does not regret his part in the strengthening of terror, his place is not in the decision making framework. Danon was responding to Livni's tour of the Nitzan camp, housing refugees/evictees from the Gaza Disengagement, in which Livni said she does not regret carrying out the disengagement. 2. Hadassah is shocked at a comment about how a Rabbi chooses where he is willing to eat out. 3. Frum n Flippin has Doers and Believers, and connects it to her shidduch experience. 4. Shiloh Musings writes about the recent psak from Rav Elyashiv about not taking money from Rabbi Eckstein's organization of International Fellowship of Christian and Jews, and points to the Jpost article in which Rabbi Eckstein responds with mentioning some haredi organizations and saying he will out more. 5. Reb Akiva talks about being more spiritually aware in Israel. 6. 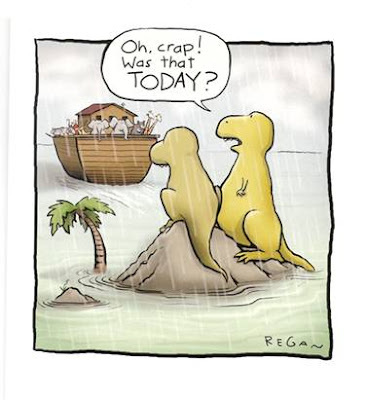 Parshablog continues the discussion of whether the Flood of Noah was a global or local flood. Rav Avraham Yosef, the son fo Rav Ovadya Yosef, the Chief Rabbi of Holon and the host of a very interesting halacha program on Radio Kol Chai, said a psak on his program on Friday. Rav Yosf said that one should avoid depositing checks into the bank (in Israel where the banks are owned and employed by Jews) on Thursday afternoon and Friday. The problem with this is that, Rav Yosef says, the banks process these checks, and balances the data, on shabbos itself (Friday night specifically) with Jewish employees. Rav Yosef adds that one could derive benefit from money deposited in this time-frame on Sunday morning, as the bank does these activities on shabbos for its own benefit, but one should refrain from it so as to prevent causing others to sin. i.e. if you can avoid on Sunday using money that was deposited on Thursday afternoon-Friday you should try to, but it is allowed. Personally I am surprised to hear that the banks work on Shabbos and have employees processing transactions into Friday night. if it is true, why have the haredi askanim not yet prohibited us from using banks (whichever specific bank does this), or fought the banks to stop them from doing so. Instead of working Friday night, they could work Saturday night (if it has to be absolutely done at night between Friday day and Sunday morning and cannot wait until Sunday). Are the banks fined for transgressing the shabbos laws of Israel? Was it well known (to everyone except me) that banks work on shabbos? This is the first time I have heard such a thing. I see this in a very serious light... the police are breaking the law. They do not have the authority to prevent me from going into Al Aqsa Mosque. As long as exclusive Israeli authority on Har HaBayit has not been returned, and Jews have not been given the ability to pray there, the Arabs will continue burning the Mount. And in some actual celebrity gossip (though I am not sure why the daughter of a celebrity also gets celebrity status), newly converted to Judaism Ivanka Trump is getting married today to her boyfriend "for whom she converted" (in quotation marks because if that were true her conversion would not have been accepted - snicker), Jared Kushner. Here is a touching story - a woman and her sister were separated at the beginning of World War II. Eventually, each thought that the rest of their family had been murdered and completely wiped out. Little did they know that they were living about an hour away from each other. For 73 years they each thought the other sister, along with the rest of the family, was dead. Only when the granddaughter of one did some research in advance of a trip to Poland with school, and she realized her great-aunt was alive from some inconsistencies in the records and then tracked her down, did they get back together for a very emotional meeting. While the gossip column is called"rechilut" in Hebrew, and this type of article seems to have no actual rechilut or lashon ha'ra, it is still a similar style. This one bought new shoes, this one had coffee with that one, this one was seen working out, this one is dating the other one, etc. And now we turn Rav Chaim Kanievsky in a subject for haredi gossip columnists reporting when he needs a new cup. 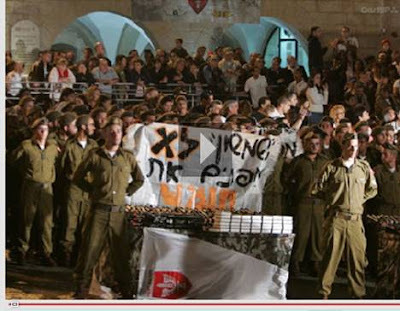 Soldiers of the Shimshon Brigade at a ceremony at the Kotel, holding up a sign in unprecedented protest stating that they do not take part in evictions of Homesh. 1. Muqata comments on the Knesset approving MK Michael Ben-Ari's request for separate hours in the gym..
2. Kaplan's Korner on the second Israel-USA basketball exhibition game, this one with the Haifa Heat, a.k.a. Maccabi Haifa, playing against the Los Angeles Clippers..
3. Samuel Sokol interviewed Adnan Husseini, the advisor on Jerusalem Affairs to PA President Mahmoud Abbas... very interesting to read how he breaks down the issues of peace and Jerusalem. He also compares the PA memorializing terrorists to the way Israel memorializes David Ben-Gurion. 4. Aussie Dave has a cool video that he calls Blooper of the Day. Pretty funny. 5. looking to draw more traffic to your own blog? Jack has written up a great list of suggestions (I do not know if they are tried and true) that might do the trick..
Burqa Babe complains about her prison conditions..
She showers with her clothes on and then she complains that her cell reeks? Her secluded inmate status, added the attorney, also resulted in her being deprived of many of the basic rights given to inmates at the Neve Tirza Prison, such as visitation and having personal belongings. Her beliefs also dictate that she wear multiple layers of clothing, shower with her clothes on, fast and refrain from any speech. The petition argued that prison authorities were ill-equipped to handle her complex situation. the prison authorities were ill-equipped to handle her complex situation? Who wouldn't be? They brought a grasshopper to Rav Chaim Kanievsky - the one that is kosher according to the Yemenite tradition - for analysis, and they speak to someone who has eaten them! The time has come to say out loud: We are no different than any other sector. Everyone is "seduced" within their own sector, and the Fanan suicide proves that. after a number of haredi businessmen have collapsed causing many haredi investors to lose bundles and life savings, The Fanan suicide shows that other sectors are the same. Under criticism why haredim tend to invest only (or should I say generally) with haredi businessmen, Fanan shows that all sectors act similarly. People invest with people like them. Fanan was in the world of sports, and he had attracted a lot of sports players to his investments, who suffered from his collapse that led to his suicide. As well, just the collapse, the high risk-high return promises, that attracted simple investors and caused them to lose, is not just among the haredim, but now a high profile case has been exposed in the secular community - Fanan. So the haredi news says "we are just like everyone else". Weren't we supposed to be better than everyone else? Isn't that what the haredi papers usually say? Ariel Sharon has been in a coma for nearly 4 years now. Suddenly his close advisers (Dov Weisglass) and some of his doctors are saying that chances are good that he will wake up in the near future and be completely normal. I have no idea what the chances of that actually are after 4 years in a coma, and how they can know it now when they have not until now, but who cares? In light of the recent developments, I am linking to an old post of mine that was extremely popular less than a year after Sharon fell into his lengthy hibernation. It was copied in many places (most not giving me credit, but I could tell it was mine because of the exactly copied wording - I had translated it from Hebrew). I don't know if this was an issue of terror, and there is very little information out there available to the public on what actually happened, but it is very strange. A halal slaughterhouse in a town near Chicago was raided by the FBI. They think it was not just an immigration issue, because over 100 agents took part in the raid, which they say is highly unusual for immigration issues. It sounds like they suspected a terror threat, and the Arabs of Chicago have been known to be supportive of Hamas and terror - a number of years ago they shut down a bakery in Chicago that was a front for raising money to support Hamas terror. Approximately 100 armed federal agents, backed by a helicopter, 50 vehicles and sharpshooters, raided a Muslim meat packing plant earlier this week but remain silent about the secret operation. Only half a dozen people work at the plant. No one was arrested, but one eyewitness said the huge police force indicates that the raid may involve criminal activity other than hiring illegal immigrants. Terror-related activity has not been ruled out, but officials have refused all comment on the case. Looking around for more info only brought me more or less the same sparse info on a couple of other websites, including VIN which also had a video of a news report reporting on it. 2. Soccer Dad on Michael Oren and the invitation from J-Street. 3. Parshablog discusses whether the Torah is meant to teach us about science..
4. Tzedek-Tzedek reviews the new book, Tempest in the Temple. 5. A couple of mazel tovs: LOZ's grandmother turned 100. Sarah got engaged. 6. Michal's Blog continues analyzing the Ivanka Trump conversion. 8. The Hashmonean points out how Livni was cut down in stereo. The Israeli public has been becoming more and more disenfranchised with the Israeli leadership over the years. Blame is placed in lots of areas - some say the MKs high salary and perks cause it, some say their lack of accountability to the public because of the electoral system, etc. MK Mickey Eitan has long been a proponent of MKs being more connected with the public, and more open with the public. Hopefully others will see fit to follow. the real benefit of this is that he has to be accountable to the people. People will see what he, and others who similarly will publicize their information, is spending and he will have to be more careful as be sure to spend wisely. If the MKs realize that everyone can see what they are using our money on, we will hopefully not be exposed to the annual end of year reports on what ridiculous items MKs spent tax money on. They will know in advance that we are keeping track, and will be more cautious. "without justice" means finding her innocent. any verdict of guilty means justice was not done. The term for civil war used was "Milchemet Achim" - at least they see us and them as brothers! If you thought it was dangerous to ride public transportation because of all the stories in the past of Arab terrorists dressing up like religious Jews and getting on buses, this growing phenomenon of Burqa ladies makes it even more precarious. A haredi woman, the crazy extreme kind of women who have taken tzniyus to the extreme to the point where they wear burqas, got onto a bus - a mehadrin bus. because of her burqa, she was suspected of being an Arab. After all, Jews don't really wear burqas - Arabs do. 1. Tzedek-Tzedek considers why the Palestinians support the Iranian nuclear bomb..
3. DovBear discusses why he considers the parsha of Noah to be the most difficult in the Torah. I was part of the original twitter conversation, and it is an interesting discussion (even though he didn't copy that part of it into the post)..
5. Hirshel Tzig is having a kapote konundrum.. It is very frustrating that there are people that go to the extent of even doubting that the Rambam visited the Mount....He writes that he entered the 'great and holy house,' a term used in all our prayers to refer to the Temple, and he is exceedingly emotional in his writing on the experience, something that is very rare for the rationalist rabbi, whose works are known for their exacting language. Do they expect us to believe that he risked his life to visit a shtiebl [makeshift synagogue] nearby? Some people are so stuck in the thinking of 'we don't go there' that they can't accept that he went there. But anyone who reads the text can clearly see what his stance was. Rabbi Richman said this about those who claim when the Rambam wrote that he risked his life traveling to Jerusalem, and visited the great and holy House, and made an annual party to commemorate the day, that he did not go to the Har HaBayit but went to a shul. In this video interview to BizPortal discussing real estate values decreasing based on the Housing and Construction Ministers plans to release lands and build apartments, Tamir Dagan, director of Shikun U'Binuy Nadlan says that in his opinion building 2000 apartments in bet Shemesh will have no real affect on the real estate market and will not bring down prices. It might help, he says, slow down slightly the price increase, but he says overall 2000 apartments in the Israeli periphery will not affect the general market. Being that even in the peripheral city of Bet Shemesh there is an unusual demand (unusual for a peripheral city) for apartments, I would venture to say it will not even bring down prices of the local market. 2000 apartments is just not enough to make a serious enough dent in the demand. Sure, they might sell cheap apartments, but they will not be cheap because of real estate values, but because they will be building lower end apartments - small, lower quality, etc. I am no expert in the real estate market, but that is how it looks to me. What do you think? I don't know who is "at fault", but some people are creating a lot of false hopes, and then shrying when they do not come to fruition. Rav Shlomo Benizri, a former MK from Shas, is sitting in jail for corruption and taking bribes. Even if you say he was framed or his sentence was too harsh, as his most ardent supporters say, he is still in jail and is treated with the rules of all prisoners. In the haredi media and forums, we are regularly being told that he is being abused by the Prison Services in this way or that. He is not being beaten by them, nor is he being overworked, and he has not been put in solitary confinement for no reason or anything like that. The abuse is in the form of him not getting special treatment. Benizri's son just had a baby. Some people were expecting him to be allowed out of jail to go to the bris. The Prison Services said they will not allow it, as he only just started serving his term and they never let a prisoner out so early in his term. Yet the haredi media is calling it "the abuse continues" and other similar descriptions. Benizri deserves no special treatment just because he is a)from Shas b) haredi c) a popular teacher in the sfardi haredi world. He is in jail, and even if his sentence was too harsh as some are wont to say, that is no reason to give him special treatment. We heard complaints that he was not allowed to dress in regular clothes when he was visited first by his family and then by Rav Ovadia Yosef. We heard complaints when he was not allowed out for an earlier simcha in the family, etc. Some people need to get it through their heads that Benizri is sitting in jail and is no longer in the Knesset. You don't automatically get special privileges in jail, just because of who you used to be on the outside pre-jail. And denying such a request is not really abuse and does not indicate anyone is anti-haredi or anti-Benizri. I was wondering what we gain making a big deal out of every time someone insults us. What do you think? We are taught that we should not be quick to get insulted and take things personally. And at a personal level many of us have perhaps worked on our middos and do not make a big deal out of every personal insult thrown our way. But as a nation we sometimes seem to take things very personally. Every time some idiot says something not nice about the Jews, we make a big deal about it and threaten them, and get them fired from their job, or sue them, or whatever. While I understand that in todays world everyone is worried about being politically correct and nobody wants to be perceived as being biased against any ethic group, but what do we actually gain by enforcing that. For example in the recent issue with the Irish guy singing at the Yankees game - he was accused of having said something anti-semitic to someone - not even publicly. The lady complained, the Yankees got upset and he had to apologize. And people still made a big deal about it when the Yankees hired him to sing again. So, did our making a big deal out of it make him, or many other people, any less anti-semitic? Or did we just push it a little bit further under the carpet - in the short term. We made people more afraid to express the anti-semitism they already have. But in the long term, perhaps we accomplished nothing, or even made people more anti-semitic as they get upset at the Jews for punishing them for "nonsense" (for example in the case of this Irish guy he said he was just shooting off his mouth cynically but had not meant anything seriously). Is the Irish tenor an anti-semite? I have no idea. He might be or he might not be. Are other people who say nasty things about Jews anti-semites? I have no idea - they very well might be, but maybe they just have an old style sense of humor and talk that way about anyone. I am willing to put out there that I think most people have some sort of latent anti-semitism, if it is not overt. That is just the way it is. people, for the most part albeit with exception, hate the jews (and Jews are not alone in this). I don't see us gaining anything by fighting to supress it every time it gets expressed. Should we fight it? I don't know. There is a sense of if they are going to talk like that, let's show 'em. But on the other hand I don't see any real gain. The debate surrounding the value of Gilad Shalit in relation to how many terrorists should be released to obtain Shalit's freedom has until now been limited to debating value. Should he be released at any cost? is this many terrorists worth his life or is it too many? etc. The need, or should I say our obligation, to try to release him, at some sort of acceptable value, was a given..
Just when you thought you have heard it all from the Neturei Karta people, they find a way to shock us all, time and time again. Now they have put out a statement saying that Gilad Shalit should not be released at all. They say he is not religious, he eats non-kosher food, doesn't keep shabbos, doesn't put on tefillin, etc. and does not fall into the category of "your brethren" and therefore there is no halachic obligation at all to redeem him. The halacha of pidyon shvuyim, they say, does not apply to Shalit because he is not religious. So, while they are willing to meet with terrorists and befriend them, hug and kiss them in public, while they are willing to call for Israel to release Hamas prisoners and give away land and everything else they say, they also prefer to let another Jew sit in captivity - not even because of a debatable value, but forever as we have no need to redeem him. UPDATE: I saw that even the Neturei Karta is now denying this statement because of all the heat they have been getting because of it. Someone in the Neturei Karta is saying that the statement put out on the email list saying Shalit is not religious and therefore not redeemable was unauthorized. you can see it here as well..
1. Parshablog has an interesting write-up about whether the Rabbi Yitzchak quoted in the 1st Rashi of Chumash is his father or not, and whether he was an ignoramus or not. 2. Michal's blog raises an interesting question about Ivanka Trump's conversion - whether converts must be held to higher standards than natural Jews. I think there is definitely something to it, but it is so for people becoming citizens in countries as well. A natural born citizen of a country will almost never need to prove his loyalty and patriotism, while new citizens, and those applying for citizenship, will have to prove their loyalty - they will have to know more, if they are involved in suspicious activities that the country might consider problematic their petition might be denied, etc. So to start out with, I would say yes. But once they have become Jews and are accepted, than they should be treated like everyone else. Jerusalem has a debt of honor to "Gandhi"... For 19 years Jewish Jerusalem was pushed aside to a corner, closed on three sides and split with a municipal line that was antagonistic and hostile...The government of Israel decided to annex the Old City of jerusalem, and the task was placed upon Gandhi. The unified map of the city that the government approved, was a result of his work, and at that moment, Jerusalem was expanded. Neighborhoods of the city from Ramot to Gilo owe a debt to Gandhi..
His clear voice is no longer heard from the podium of the Knesset. That voice has left a vacancy... There were times where his words would arouse anger, but you would know that they were said from his heart. His positions seemed to be poured from iron - they were not yielding over time...Gandhi formulated his views in the Palmach, and later brought them to the Knesset. "Greater Israel" was not a racist ideaology. One should not confuse the two... Gandhi was a son of the land. He would walk with the Arabs of the land and he spoke their tongue. he adored them. But in the national debate, he would not compromise at all. On a personal level he was careful about honoring each person....his being missing is painful, and his contribution will never be forgotten. he is engraved in the memories of his adherents and his opponents. The Israeli Supreme Court handed down a ruling in the case of the "fake hechsher" Keter HaKashrut vs. the Rabbanut. the Rabbanut has been working hard to remove the "fake hechshers" from the marketplace - hechshers such as Keter HaKashrut and Tiferet HaKashrut, among others. These are known to provide a piece of paper declaring the restaurant to be under their supervision and meeting the highest standards of mehadrin min hamehadrin, yet in reality, they often never send any mashgiach to check the place out, and their only contact with the restaurant is to pick up a check and to deliver a certificate. Keter HaKashrut sued the Rabbanut to get them off their case. The Supreme Court decided that the Rabbanut has the right to work to prevent the defrauding of the public regarding kashrut. Also, this applies not only to something not kosher fraudulently being labeled as kosher, but equally so to the level of kashrut - if they claim to be certifying at a mehadrin level but are not actually, the Rabbanut can protect against this as well. The Supreme Court also accepted the Rabbanut's claim that Keter HaKashrut is not on par with the level of kashrut they claim to be certifying. While such a decision is important and will hopefully strengthen the Rabbanut in their fight against the "fake hechshers", there is something troubling about it. They say the Rabbanut has the right to work against the defrauding of the public in kashrut issues. I would say it is not their right to do so, but their obligation to do so. Their raison d'etre. This might just be an issue of semantics though. Even more important, what is disturbing is that the Supreme Court affirmed that Keter HaKashrut is not at the standards, as per the claim of the Rabbanut. This disturbs me because what will happen in the future is that various agencies will petition the court to determine their level of kashrut - rather than allowing the Rabbanut to define what "Kosher" means, what "mehadrin" means, etc. and either a certifying agency fits the category or not, now the Supreme Corut is affirming the levels of the agency. This time they affirmed it as per the Rabbanut, but who says they will do so next time as well? Maybe next time the Rabbanut will try to get rid of another "fake hechsher" and then the Supreme Court will define them differently. In essence, the Supreme Court is becoming the defining body on what is considered kosher and what is considered mehadrin, and that is troubling. A secular body, one that defines secular law, should not be defining standards that are based in religion. they can be used to uphold laws that involved religion, or even to challenge such laws, but to define religious standards - that should only be done by the Rabbanut or another religion based institution. 4. LOZ writes about the teenage Jewish hostage of the Black September terrorists..
6. Tzedek-Tzedek has the card that will save 100 lives a year..
Half the children in Israel are starving [due to poverty], we cut the child allocations and do everything to suppress the Jewish spirit. Suddenly, when we are talking about non-Jewish children, they suddenly become so merciful and the Jewish spark in them ignites. Those same groups of people who work for the rights of the children of the illegal foreign workers will never donate even half a shekel to a sick Jewish child, because their truth is to turn the Jews into goyim. Bidding closes in a few days, so place your bids now! Usually I would just ignore these fliers, as they get passed around fairly frequently, but they reminded me of an interesting point I have made to some people verbally in the past. Some people feel very strongly about Har HaBayit that it is assur to go up, and they will always say how the rabbonim are against it, quoting most prominently the gadol hador Rav elyashiv and nobody else can argue on that. I say, if you are so into following Rav Elyashiv, then why does your wife wear a wig? Rav Elyashiv says it is assur to wear a wig and one must only cover her hair with a tichel. So, you only listen to Rav Elyashiv when it is convenient for you, and you are willing to follow other opinions when Rav Elyashiv's is not convenient for you. So why do you care so much about me going up to Har HaBayit against Rav Elyashiv's psak? Usually the person has no answer. The Director of Lev Malka, Rav Aharon Aberman asked Rav Elyashiv a shailoh if he is allowed to daven on behalf of a non-Jew at the Kotel. A non-Jew, a Christian (religious presumably and based on the article I will assume Catholic) once donated to his organization for sick children with cancer, and he recently contacted them offering another donation. The condition he set was that they daven for him at the Kotel to succeed in his business. Rav Aberman was uncomfortable with the condition and asked Rav Elyashiv if he is allowed to or not. Personally I would not have thought of asking. I would have assumed that because of Darkei Shalom, if asked specifically, one is allowed to daven for a goy. Differentiating between an idol-worshiper and a non-idol worshiper is an interesting distinction, and makes me think that the goy in question was a Catholic, as we consider Catholics to be idol worshipers, while other Christians are not necessarily idol worshipers (for them to be Christians - for a Jew it would be). It is prohibited to use a taxi (in Israel where the taxi drivers are jewish - maybe a solution would be to use an Arab taxi driver) for transportation during chol hamoed. A bus is allowed, because that is public transportation and tzorchei tzibbur is ok, but a taxi is private and therefore not allowed. It is not allowed because you are forcing the driver to work on chol hamoed, which is not allowed. To me, this chumra makes no sense. the taxi driver is allowed to work because of davar aveid. the prohibition of working on chol hamoed is not definite, as it is on shabbos, and he has enough hetterim to work that it should not be considered that you are forcing him to do something wrong. For him to drive you somewhere on chol hamoed is almost always going to be tzorchei moed, and therefore allowed. if it were so, it would not be allowed to walk into any store to buy anything or perform any melachos, which is not the case. is merging parties really possible? Every once in a while, discussions of possible party mergers become known to the public. We generally want to see the various religious parties merging and working together for the common interests. Whether it is specifically the haredi parties merging with each other and the dati leumi merging with each other, or whether it is all the religious parties merging into one large bloc - including all the haredi parties and all the dati leumi parties together. According to various news reports, the Bayit Yehudi (formerly NRP) and National Union parties are in merger discussions. They want to maximize the National Religious power, and that cannot be done as a couple of small splinter parties. If they would merge, and together hold 8 seats, in the future voters would look at them differently - as a medium sized to large party and perhaps give them more votes than people give to small parties, thus garnering even more power. But can it work? Bayit Yehudi is a more diverse party, dealing with issues involving all aspects of governance and the State, while National Union is more of a one-issue Land of Israel party. Bayit Yehudi is a fairly liberal party - try to attract all the dati leumi, and there are a wide range of beliefs and worldviews in the DL world just as there are in every community, while NU is a more conservative, some would say extreme, right wing party. What will happen when Netanyahu wants to give land away to the PA? The BY faction will say it is important to work against it from within the government, and the NU faction will insist on exiting the government to fight it from outside. Other scenarios would present similar issues. Obviously these are issues that, if a merger is to work, need to be discussed in advance and set as to how such situations will be dealt with. I hope they can make it work, and find solutions for these potential flareups, because the hamon am would really benefit from a unified party. A factor of war or redeeming a captive? A friend posed an interesting question to me about the Gilad Shalit situation, and I wanted to ask you out there what your thoughts are on the matter. He asked me why we relate to Gilad Shalit being held in captivity as an issue related to pidyon Shvuyim - releasing captives - and therefore the debate centers around how many terrorists is considered a fair price for releasing Shalit. Why are we not relating to Shalit's captivity as an issue of hilchos melachim - kings, and how they wage war? Because he was taken as a soldier by the enemy in an ongoing conflict (and an actual military operation/war was the direct result), we should relate to his captivity solely relating to the issue as one of war strategy - do we give up this many or that many and how each option would affect the ongoing war. Personally, I am not sure there is really any difference between the two perspectives. Either way we are looking at Shalit and the options for bringing him home with the approach of this many terrorists is unreasonable, those types of terrorists are unreasonable, these are acceptable, etc. What is the actual difference between comparing it to pidyon shvuyim or to halachos of war? I am not sure. Maybe it is just our halachic approach. To the government, such a debate would hold no interest - there seem to be no ramifications to whether Shalit is looked at as a captive or a pawn in war strategy - either way we are calculating how many terrorists released would still be "relatively safe" and how many would increase our level of danger too much to be worthwhile. But the halachic classification does hold some interest, as the debate centers around a different aspect of the issue. If he is approached simply as a captive, in a halacha debate (for example, when the religious leaders are asked to support this or that plan to release Shalit) we would solely look at the value of Shalit in relation to the value of releasing x number of terrorists. If we approach Shalit as a factor of war strategy, the halachic debate must center around the perspective toward state and war - will releasing x number of terrorists help us or harm us in the war on our enemy. 1. Torat Yisrael reviews his recent trip to Kever Yosef..
How many go up to Har HaBayit? Only 4658 Jews went up to Har HaBayit during the year 2009. The statistic was announced by Minister of Internal Security Yitzchak Aharonovitch. Only 4658? He didn't say how many went up in 2008, 2007, 2006 and further back, so we do not have any indication if the number 4658 is a number on the inclince or decline. Maybe 4568 is a great number (great for those who support Jews going up) as perhaps it is doubel the previous year. Who knows. The number on its own shows little about how Jews feel about going up to Har HaBayit. Also, the number 4658 only includes religious Jews. Only religious Jews are counted and limited in our access to Har HaBayit. The police only check us, while anyone looking secular is allowed to go up with nary a glance. So there are thousands more Jews going up, just they are not religious and therefore not counted. Aharonovoitch used this statistic to show that despite the minute, and relatively insignificant, amount of Jews going up to Har HaBayit, and taking into account the strict limitations imposed upon them, the Arabs still rioted and find any excuse to, making it clearly obvious that it is not the Jews ascending causing the provocation, but the Arabs looking for excuses. During the debate over the issue in the Knesset, the number above was discussed and thrown around, and it was also used in the context of showing how few Jews are interested in going up to Har HaBayit, seemingly because of the overwhelming issur by the rabbonim of the day. The problem is that this number is misleading, despite our not even knowing if it is an increasing or decreasing number. The number is misleading, because, I would say, 4658 Jews went up to Har HaBayit in 2009 despite the limitations, inconveniences, intimidations imposed upon them by the police. For example, I have not gone up in 2009. Unfortunately. Every time I planned to, I encountered a different problem. One time I went and found Har HaBayit closed and there had been no statement for me to find that out anywhere in advance, wasting a lot of my time. Other times it didnt work out for other reasons. And even more times I just said to myself that I don't have the time to waste - you go to Har HaBayit, and it is supposed to be open to jews at 7:30. So you get there and are waiting already at 7:15 so you can get up quickly. But the police then don't even start checking you until almost 8:00. They are busy with other things, they are letting secular or non-Jewish tourists pass first, whatever. Then you waste 15 or 20 minutes waiting while they go through all the background checks and searches of the various people waiting to go up. Then they decide to limit it to small groups, so you have to figure out who will go up first and who will wait 45 minutes or so and go up int he second group, etc. Basically, they make it extremely difficult and inconvenient to go up, and then you can't even go up with a siddur. You go through demeaning checks for anything resembling a prayer book. Then you go up in your limited group, and you are followed closely by a policeman and at least one Arab agent of the Waqf. They are watching you closely - if your lips even move or if you twitch the wrong way, the Arab will accuse you of praying, and the policeman will be forced to arrest you, at best. So I am pretty sure that if they lessened the restrictions on Jews and made it even just slightly easier for us to go up, I am sure more Jews would. Many do not simply because of how difficult and inconvenient it is. One of the reasons, perhaps the main reason, given for opposing many "settlement" or "settler" activities, such as creating outposts, expanding settlements, and the like, or even activities that are being branded as "settler" or "nationalist, like going up to Har HaBayit, is that we are not supposed to provoke the nations of the world. we are not supposed to be agressors. We are supposed to be meek and timid, and only do what they allow us to do and not take steps that will upset the non-Jewish nations. "Assur L'hitgarot ba'umot ha'olam" - it is prohibited to provoke the nations of the world. While this might be good advice, or maybe bad advice, depending on your perspective, I am not aware of an actual source for this issur. It probably comes from the periods in history in which Jews were subservient to our non-Jewish, and often hostile, overlords, and it became reasonable to say not to do anything to provoke the goyim. I was thinking about this because of our reading of Breishis this week. The first Rashi in the parsha, in all of the Torah, is perhaps one of, if not THE, most famous Rashi commentaries in all of the Torah. Rashi begins by asking why the Torah begins from creation and all th stories, and not just skip right to the first mitzva which comes much later. After all, the Torah is not a history book. Rashi answers by quoting Rebbi Yitzchak who says that the reason is that if the goyim should claim that we stole the land of Israel from them and they would demand it back, we should know and say that we are not robbers or thieves, but God gave us the land. And even though it was given to others first, because God created, and therefore owns, everything, He can give what He wants to whom He wants, and He can take it away and give it to others. So as long as we have the land, the stories in the Torah from Breishis until the first mitzva give us the justification to settle the land and live in it despite the protestations of the non-Jews. The recent riots by Arabs on Har HaBayit and in East Jerusalem have prompted the reiteration of such statements like "It is prohibited to provoke the non-Jewish nations" to justify opposing ascending Har Habayit. I never liked the issur of "not provoking". In my mind, our mere existence is a provocation. Beyond that, any specific incident or issue is simply an excuse for the non-Jews to be upset at our existence. Is it a provocation for us to go up to Har HaBayit? I say no - it is an opportunity for them to riot, though they really could care less about Har HaBayit and are upset about our being anywhere in Israel, and even that we exist at all. So, as I was reading the Rashi, the first Rashi in the Torah that I quoted above, I realized that, to me at least, it looks like Rashi takes a similar approach to the [non-existent?] issur of "not provoking. Rashi, quoting Rebbi Yitzchak, says we have a right to settle the land because God gave it to us. We have to know that, and we have to state it unequivocally to the goyim in response to their claims. Rashi does not add that if they make claims against us, despite it being ours, we should be meek and give in to their demands in order to not provoke them. Just the opposite! Rashi says clearly that this land is our land and God gave it to us and we must settle it and defend our rights to do so in the face of the protests of the goyim. According to Rashi there is no such issur of "not provoking the goyim". So if your only reason to not go up to Har Habayit, or to not live in the "occupied territories" or to not support the army killing the enemy when necessary, is because we are not supposed to provoke the goyim, that is not true. We are supposed to live in the land God gave to us, and we are meant to do so fully and defend our right to do so! Now we find out that Barak is not trendy, is not cool, but is a posek halacha. After Avishai Braverman turned into a hassid of Rav Elyashiv regarding the issue of Har HaBayit, claiming that he is opposed to Jews ascending Har HaBayit because the rav paskened so, now Ehud Barak comes along and tells us his halachic opinion regarding the halachic issue of women singing. It seems that the Labor Party has given up hope of attracting the secular voters of Israel, and has decided, as a strategic approach, to take away votes from the Haredi parties. Eli Yishai and Litzman - Beware! Barak is breathing down your necks! Ben-Ari said this in response to DM Ehud Barak "paskening" during a talk with soldiers who are in the process of converting to Judaism. Barak told the soldiers that it is permitted for them to listen to female soldiers singing at army performances "if their voices are nice". Barak bastardized a psak of Rav Ovadiah Yosef, who allows listening to female voices via the radio or recorded music, and applied the psak to live music as well. Barak's statement raised the ire of rabbonim close to Rav Elyashiv for getting involved in issues of halacha, and this, they say, is a classic reason why the Conversion Beis Din of the army is not reliable - because they are subject to pressures from politicians and generals and are not independent enough. Moshe Feiglin's idea is that if enough soldiers sign in advance that they do not want the government to negotiate on their behalf if they should fall captive, Hamas would have no motivation to abduct soldiers. They will know that they cannot be used to negotiate the release of prisoners, so they would have no reason to abduct any soldiers. Israeli Nobel laureate (chemistry) Ada Yonath's idea is that we should right now release all Palestinians and Hamas prisoners held in Israeli jails. Just let them go. If we will not be holding any of their people in our jails, they will have no reason to abduct any of our soldiers. These are polar opposite approaches, and each has a modicum of logic to it. Er.... that would be they are both logical approaches assuming Hamas needs a reason to abduct Israeli soldiers, and they only do so in order to free their own people. if you take the approach that their ultimate goal in abducting soldiers is simply to terrorize Israel, then neither approach will help. The usage of the captive soldier in negotiations is simply a bonus, not the ultimate goal. They (Lebanon, Iran, etc.) have had other soldiers that they have not used in negotiations, which, I think, indicates to a certain extent that the goal is not really to free the prisoners, but to terrorize Israel. What couldn't they have gotten in exchange for Ron Arad or Zachary Baumel? Yet they have never used that card - even when we were holding very high level Hamas people. 1. Tzedek-Tzedek has proposed a solution to the inevitable negotiations that will definitely include talks of what to do with Har Habayit. 5. Frum n Flippin - Frum n Feminist? 7. Esser Agaroth has the scoop on Dmitriy Salita's chalenging the crown.. They could have killed him! As I said, they are crazy.. The Bet Shemesh branch of the Eidah community suffered a serious blow on Shabbos-Yom Tov when their leader and rav, Rav Rosenberger, collapsed during the hakafot. It seems he had a serious stroke and was in critical condition for a while (it seems his situation has stabilized). The MDA team came to resuscitate him and take him to the hospital for care, and according to this report, his students surrounded the ambulance arguing about which hospital they would let MDA take him to for care. It seems that some students were against his being treated in Hadassah, the preferred hospital of the MDA team, because of the recent tension between the extremists and Hadassah. Sanity prevailed when Mrs. Rosenberger asked MDA which hospital is best suited to treat his problem. They said Hadassah and she then insisted that that is where he would be treated. I guess they felt they know better than even the Gaava"d of the Eidah who was also hospitalized last week and chose Hadassah, despite the recent tensions, because of it being the most appropriate for his needs. That was only the beginning. After getting all that worked out, they still fought with the ambulance team regarding who would accompany Rav Rosenberger to the hospital. MDA rules say only one person, a family member, can accompany the ill in the ambulance. An extra student jumped in and fought with the MDA driver. Eventually they got rid of him and continued on their way, after calling the police, and after the driver himself got injured from a dorr being slammed into him when evicting the student. All this fighting while their rav is unconscious and in critical condition after collapsing in front of them, causing delays in his receiving treatment. They are lucky they didn't kill him in the process by delaying his receiving the care he needed!